None of my babies have been lightweights, if you know what I mean. That doesn’t matter so much as they develop their independence and are keen to get out there exploring the world solo – but when they want to be carried a lot (and they did! ), you’d better believe your back is going to know about it. Here’s a product that would have saved my poor back! When my daughter was about 18 months old, she didn’t fit into a baby carrier anymore but she wanted to be on my hip constantly. I even started walking in an odd kind of right hip thrust out way in order to correct my balance while she was constantly attached to my right hand side. Over time, a physiotherapist told me that the reason my back had started to give me grief was that I was carrying her everywhere without support and she was just too heavy. The brand new Hip Seat from Ergobaby was designed for situations just like mine, and plenty more besides. It’s the best friend of parents whose children want to be up one minute, and off exploring the next. It’s the helper to parents who have had a child finally fall asleep in their arms while out, but can’t carry them for much longer without their bodies crying out in complaint! 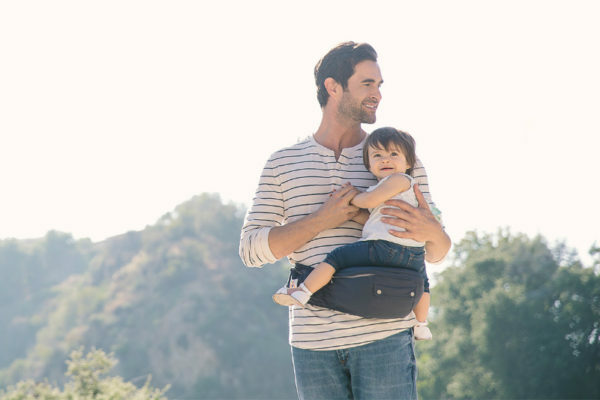 You can use it like a regular baby carrier (with more room for little, or not so little bottoms) – with panels that zip on for even more support, or strap the seat around your hips kind of like an old-school bumbag when you need just a little more support to keep your child close for longer. It gives you the support you need to carry children up to 20kg (so, school aged really!) in a conveniently small package. Use it on your front, back or side, depending on how you’d like to carry your child. If it’s a hot day, or you want the convenience of picking up and and putting down your child quickly, or you just need a little extra support, then use it in just the seat mode. If you want to be able to use your hands, or your child has nodded off, easily attach the support panel by zipping it on, and the Hip Seat works just like a regular carrier. The Hip Seat comes in two colours (Twilight Blue and Galaxy Grey) and retails at $199. You can pick it up at Babes in Arms and selected Ergobaby retailers.